You are at:Start Reading»Pregnancy»Diet & Fitness»Can Pregnant Women Eat Smoked Ribs? Can Pregnant Women Eat Smoked Ribs? Let us now see what is smoked food, how safe is its consumption, what is the meaning of smoked ribs, how safe is its consumption what types of ribs are better, the process for storing ribs, the risks it carries when consumed, and the right method to prepare it. Smoking is the technique to either cook, preserve or add flavour to a certain type of food by exposing the same to smoke from a burning material most common being wood. The process of smoking has been on since olden times. The usual foods that are smoked are fishes, meats and even types of cheese as well as vegetables. Is Smoked Food Safe during Pregnancy? There happen umpteen changes in the hormones at the time of pregnancy,the twirl of hormones many times overpower ones’ immunity system. Having smoked food during this phase can even lead to severe infection and result in stomach pain, fever, loose stools and dehydration. Any sort of acute infection can even prove fatal for the mother as well as the baby, leading to miscarriages, pre-mature delivery etc. Thus, it is advisable to consume smoked food in moderation and ensure it is cooked well. By the word ribs, we mean the fleshy part of the chops which is mostly cut as a slab and not separated into ribs. Ribs of lamb, beef, pork and mutton are greatly consumed. In several parts of the world ribs of even goat, ostrich, crocodiles, alligators, buffalo, kangaroo and many other animals are consumed as well. The ribs can be consumed by either roasting, grilling, baking, smoking or braising. How Healthy Are Smoked Ribs During Pregnancy? Pregnancy is a critical phase so one should be prudent before selecting the foods to be consumed. It is important as the mother’s nutrition greatly affects the growth and the development of the foetus as well. Certain types of meat especially the smoked ones should not be on the list. The reason being they carry a lot of bacterial as well as parasitic infection. It is better to be cautious than sorry. Which Is Better ? Spare Ribs Or Baby Back Ribs? The ribs are taken from the belly, less fleshy than the back ribs and known as spare ribs or side ribs. They are thicker and juicier than the baby ribs, whereas the baby backs are more curved, thin and rounderin shape. They are taken from the upper as well as lower areas of the ribs and the spines. Since these ribs are smaller in size, they are called baby back ribs and arefleshier.Both are equally good till they are cooked well. 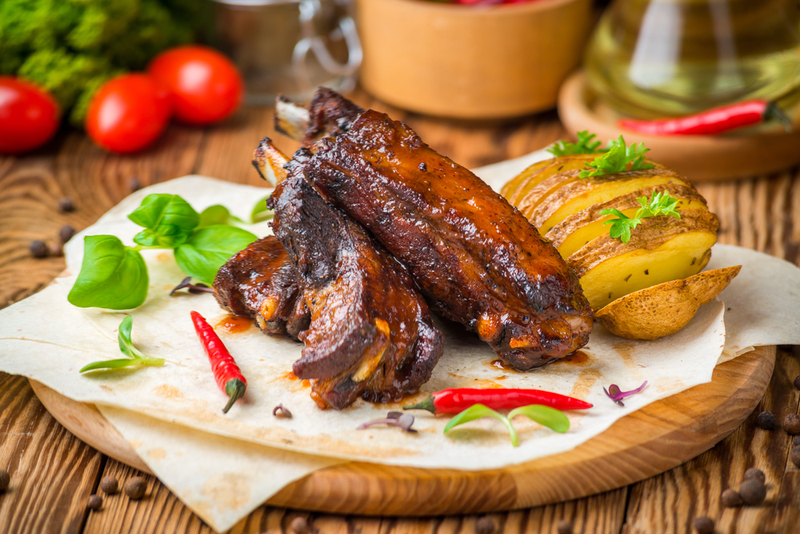 How Long Does Smoked Rib Last – When Refrigerated Or Frozen? In case the smoked ribs are stored in a proper way, the cooked ones can last from 3-4 days in the refrigerator. In case one needs to store it for a longer time, they need to be frozen in covered and airtight containers or freezer bags. They can even be tied or wrapped tightly with aluminium foil or freezer wrap. How Long Can Smoked Rib Last Without Refrigeration? In case one wishes to keep the meat safe without refrigeration, it can be left at a temperature of more than 140 degrees Fahrenheit for a couple of hours. In case of keeping it out, it can only be left for a maximum of two hours after which it should be discarded. What Are The Risks Of Eating Smoked Ribs During Pregnancy? Contamination issues-Smoked ribs, if consumed during pregnancy can pave way for bacterial infections like listeria and E.coli which result in acute stomach pain, headaches, fever, nausea, muscle pain and this could be fatal for the baby leading to miscarriage, premature delivery, dehydration, loose stools and even death. Risk of Carcinogens- The meat that is grilled or barbecued from smoking wood is also referred toas smoked food. When the oil, gas, tobacco etc. burn the hydrocarbons are released in the air which is one of the reasons causing cancer as they combine with the burning of the charcoal smoke as well as the meat fat. This is very dangerous for the bay as they are very sensitive. One should select the ribs that are thicker and fleshier. Remove the fat that is hanging from the bone side. It is ideal to even trim off the tougher skin. Always slide the tip of a meat thermometer below the membrane and above the bone. Always use a paper towel to pick the membrane edge and then peel it off. Spike up the ribs very lightly both on the bones as well as the edges. It is important to season deeply on the fleshy side. Finally, place all ribs in the rack in a manner that all of them face in one direction. Make sure the ribs are cooked until piping hot. Thus, it is important to be very selective with respect to the foods to be consumed during the pregnancy phase. Due to the changes that take place in the body, both the mother-to-be and the foetus have high chances of being food poisoned. Having smoked ribs can lead to many infections which could prove dangerous as well as fatal. It is better to ensure that the food is properly cooked and it is completely safe for the mother as well as the baby. So it is ideal to take the required steps toward, cleaning, preparation, storage as well as consumption.